All the details are coming together for ACN’s 2016 Ronald McDonald House Celebrity Golf Tournament, a yearly tradition that brings celebrities, corporate sponsors, participants and volunteers together - with 100% of proceeds going directly to the Ronald McDonald House of Charlotte. Final preparations are underway for ACN's 6th annual Ronald McDonald House Celebrity Golf Tournament, with 100% of proceeds going to the Charlotte House. Bringing people together for the greater good is what ACN - and this tournament - are all about. Final details are coming together for ACN’s 2016 Ronald McDonald House Celebrity Golf Tournament, a yearly tradition that brings celebrities, corporate sponsors, participants and volunteers together for a day of fun and competition at Trump National Golf Course in Mooresville, NC. Hosted by ACN Global Reach Charities, the event will take place on May 9th, with 100% of proceeds going directly to the Ronald McDonald House of Charlotte – a home-away-from home for families with sick children. Last year's tournament raised over $250,000, setting a new record. 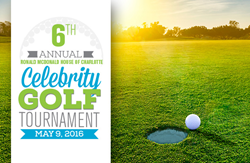 With the help of all of the event’s sponsors, ACN is confident that the 6th annual Ronald McDonald House Celebrity Golf Tournament will break new records - while commemorating the fifth anniversary of the Charlotte house. ACN is honored to have DISH Network as the presenting sponsor of the 6th annual Celebrity Golf Tournament. DISH Network’s sponsorship will help ACN and the local community make a large and lasting impact on Charlotte’s House and for the families it serves. Each of the event sponsors make this event possible. With their support, ACN can impact the lives of countless families in the Charlotte community. Sponsorship opportunities are still available, and ACN welcomes inquiries from interested organizations. Please contact ACN at http://www2.acninc.com/golf/ to find out how you or your organization can be a part of this event. ACN is the primary donor to ACN Global Reach Charities and has long been a supporter of the Ronald McDonald House Charities and of the House in Charlotte. In 2008, the company chose Ronald McDonald Houses as its global charity and began collecting donations for the local Ronald McDonald House chapter at each of its quarterly training events held throughout the world raising millions of dollars for this worthwhile charity. Founded in 2011, ACN Global Reach Charities is a non-profit organization with the mission of expanding the charitable efforts initiated by ACN, Inc., providing focused management and increased fundraising efforts. The non-profit continually seeks out new opportunities to work with charitable organizations and is devoted to making improvements on a local level. Its grass-roots efforts have raised awareness in the Charlotte area and surrounding communities. In addition to its many efforts, ACN Global Reach Charities organizes and hosts the RMHC Celebrity Golf Tournament, an event designed to raise money for the Ronald McDonald House of Charlotte. For more information on ACN Global Reach Charities, visit http://www.acncharity.com. The RMH of Charlotte serves the families of children being treated at Levine Children’s Hospital and Hemby Children’s Hospital. Located at 1613 East Morehead Street on land donated by Carolinas Medical Center, the House features approximately 35,000 square feet of living space complete with 28 bedrooms, providing more than 10,000 nights for the families. The mission of the RMH of Charlotte is to provide the families of children being treated in area medical facilities with a safe, affordable and caring “home away from home”. For more information on RMH of Charlotte, please visit http://www.rmhofcharlotte.org. Founded in 1993, ACN is the world's largest direct seller of telecommunications, energy, and other essential services for residential and business customers. ACN provides the services people need and use every day including phone service, wireless, energy, payment processing, television, security and automation and high speed Internet. ACN operates in 24 countries with offices located throughout North America, Latin America, Europe, Asia and the Pacific. For information on ACN's home-based business opportunity, visit http://www.acninc.com.